About the New Manor Ground A real mix of styles at Ilkeston as you have some traditional elements mixed with some new features. The ground literally hugs the road meaning that expansion has been hard but the club have built an innovative administration block which sits in the north east corner of the ground, with covered seating on top of this and topped off by a clock tower. Behind the north goal is a traditional covered terrace which is where the away fans tend to congregate. At the opposite end it is a covered flat area and fans tend to stand against the fence around the pitch. This extends around the east side of the ground where you will also find the club shop and the Robins social club. How to get to the New Manor Ground From M1 Junction 26, take A610 signposted Ripley. Leave the A610 at the first exit (signposted for Ikea) on to the A6096 signed Awsworth/Ilkeston. At the next island join the Awsworth by-pass, signed A6096 Ilkeston. Continue for approx. half a mile and turn right into Awsworth Road. Small signpost marked Cotmanhay. The ground is half a mile down this road on the left hand side. There is a car park at the ground that is free of charge. If you are coming by train the best route is to either Derby or Nottingham and then get the Ilkeston Flyer or bus 59 from the former and 20/21 from Nottingham. How to get a ticket for the New Manor Ground Pay on the door for all despite the small capacity. Admission for Adults is £9, one of the cheapest in the league although £6 for Under 16’s is quite expensive. Programmes are £1.80. OUR LAST VISIT – APRIL 2010 Ilkeston…Derbyshire’s riviera some say and home to a world record holder. Have a wander around the Market Place on a Saturday and you may bump into William Roache MBE, better known as Ken Barlow, who holds the unique world record of playing the same character in a TV show for the longest period of time (52 years and counting)….Those long winter nights must fly by in the Guinness World Records department these days. Ilkeston, sitting in the Derbyshire Borough of Erewash is almost in Nottinghamshire. The M1 is used as the boundary between the two counties and is another one of those towns that doesn’t have a railway station. It seems hard to believe that as a southerner I have the choice of three suburban stations within 2 miles of TBIR towers, yet here is a town of 40,000 that has no railway line. It did used to have one but in 1967 Midlands Railways decided that jetpacks were the future and closed Ilkeston Junction. Hardly handy when you have a football team in the town who were playing the biggest team in the league in terms of travelling fans. Ilkeston Town, sitting just below the playoffs in Blue Square North with games in hand had gone through a troubling last few weeks after club owner Chek Whyte had been made bankrupt at the start of the season, throwing the club into some turmoil. However, this week the club were finally rescued by Gary Hodder who completed the take over of the club. This Easter period would be key for their play off challenge, starting with the home game versus AFC Telford United, arguably the biggest club in the division. We had experienced the passionate away follow of Telford last season at Alfreton Town (see here for details of a classic match) and expected a similar level of noise from them back in the Midlands. Ilkeston had somehow managed to stockpile lots of home games. They had four consecutive home games to come and including these they will had played eleven of their last thirteen games at the New Manor Ground. And it was this home advantage that they hoped would take them into the play offs. So why was I here in the Erewash valley in the first place, apart from stalking Ken Barlow? On the trail of chips with gravy of course. It was a family Easter and so we were decamped for a couple of days at Northern Steve’s so it would be rude not to take in a new ground whilst we were here. The original plan was a trip to Retford or Grantham yesterday but the scum of the road, the caravan, delayed our arrived by nearly two hours after two of them flipped over on the A1. Why do all other motorists have to suffer at the hands of these irresponsible contraptions? Why can’t they be limited to 30mph and only travel between 1am and 3am? The Robins, as they are known, are managed by Kevin Wilson, the ex-Chelsea and Derby County managed who knew his way around this area and division thanks to spells atKettering Town,HucknallTown and Corby. Wilson featured recently quite prominently in the book “The 39 Days of Gazza” (see our review here) as he was in charge before (and after) Gazza joined Kettering Town. He had done a good job with the team, getting them within touching distance of the play-offs with just a few games to go. A seven game unbeaten run had set them up for the Easter weekend where six points could take them up to the dizzy heights of 4th. And in the week before the game he wasted no time in bringing in Ex-Nottingham Forest striker Jason Lee – you know the one…No? Well let me just sing you a little song…”He’s got a pineapple…” Enough of that anyway. So after a drive through some of Nottingham’s areas we ended up in the backstreets of Ilkeston. I had left the trusted TomTom in the other car so was directing Northern Steve via my Google Maps but unfortunately the right turn we needed in the town centre was obscured by a smudge on the screen and we ended up taking a tour of closed down pubs that seem to litter the area (including the fantastically named Live and Let Live which was certainly dead!). But eventually we found the ground, pulled up outside the turnstiles just as the game kicked off. Chips and gravy would have to wait… Ilkeston Town 2 AFC Telford United 1 – The New Manor Ground – Saturday 4th April 2010 When was the last time you saw a clock tower at a football game? With over 250 grounds under my belt around the world I have to say that I have never seen one, so one tick in the box there for Ilkeston. There was also no tunnel, with the teams instead wandering along the front of the building in the corner after coming out of a door in the wall. They also had a dugout for the programme seller, which at £1.80 was also a first (Surely £2 or £1.50 would be easier to manage?). The pitch was slightly raised, which meant poor little Lolly couldn’t actually see anything so we had a wander around the ground. One thing that was noticeable was the average age of the home fans – if I was to say that Ilkeston flat caps were the biggest seller in the club shop you would get an idea what I mean. The first twenty minutes or so were hardly memorable. Both teams seemed to find the pitch hard work, and it soon starting cutting up making the passing game quite hard. Jason Lee, on his debut started well, holding the ball up and trying to bring in the Ilkeston wide men notably Josh Burge who came the closest to opening the scoring just after the half hour mark when he exploited a clearly struggling Killock at left band for Telford and then smashed his shot into the side netting, causing the usual cheers as if the ball had gone in for those fans on the opposite side of the pitch. Both sets of supporters, standing side by side on the covered terrace did their best to try and raise some enthusiasm for the players. We took the opportunity to prepare ourselves for the main event – the Chips with Gravy test. Signs looked good as we queued up with not only chips and gravy, but also mushy peas and cheese. Northern Steve was in the seat for this one and even threw in a sausage cob (it’s a roll! a cob is something that corn comes on!). And the verdict? Hmmm not good I am afraid. Chips a bit underdone, gravy too runny and ended up swimming in the plastic tray rather than being absorbed. Northern Steve gave it 3/10 meaning near rivals Hucknall Town still held the inaugural CaG trophy for this season. Half time came and we sampled a lovely pint and a quarter of Theakston’s Mild (buy one get a quarter free) in the Robin’s club house and Northern Steve made up for his chip disappointment with a £15 win on the fruit machine, which he had absolutely no idea what he was doing. The second half was a much better affair. Both teams had chances in an entertaining game. Telford came close twice, firstly when Telford’s Matt Blair got in front of a Newton cross before the Ilkeston keeper but could not get his header down and it sailed over the bar. 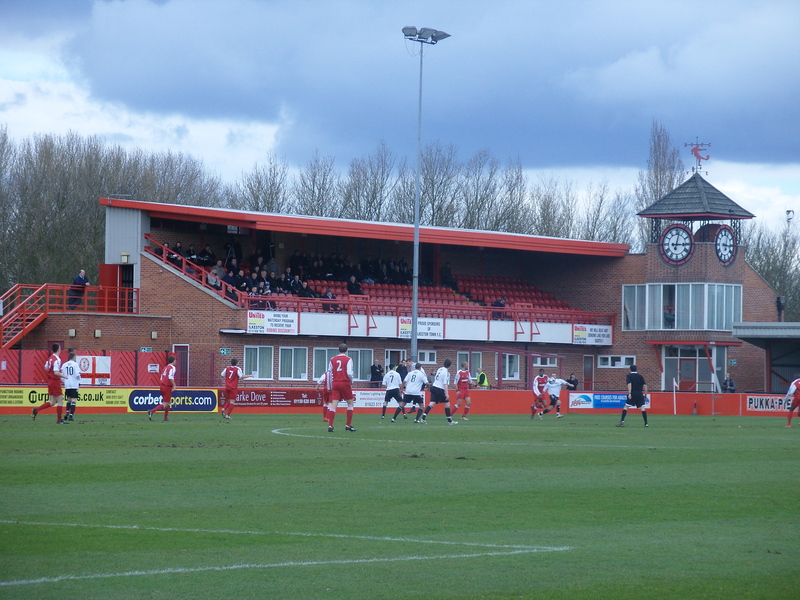 Ilkeston responded and Rodney should have done better with his chance from a corner. It was no surprise that the opening goal came from a corner though, and Ilkeston could have done much better in clearing a corner before the ball came over again and Adam Dugdale towered above the rest to head home. One almost became two a few minutes later when substitute Thompson’s shot from 25 yards almost caught Ilkeston’s keeper out of place but he managed to get a hand to it and pushed it over the bar. The turning point was undoubtably the performance of man of the match Mr Newman the referee from Barnsley who got just about every decision wrong. Quite what Adam Dugdale, the Telford United centre-back did to warrant a second yellow just after opening the scoring I will never know, but the referee let play continue before issuing his marching orders. 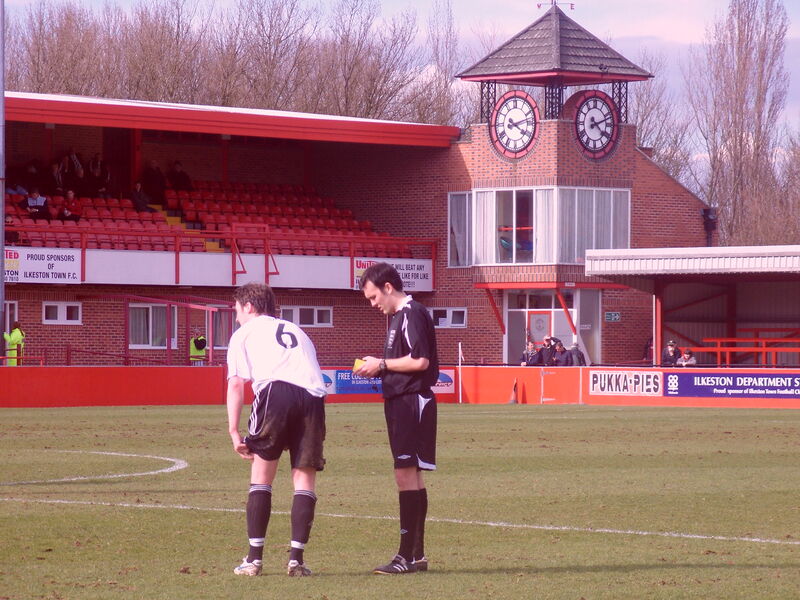 Ilkeston sensed a way back into the game and brought on Darren Caskey. Now I remember Caskey when he was at Hornchurch as part of the ColdSeal revolution which saw other professional players such as Dimitri Karin play at a non-league level. Now, at the age of 35 Caskey had dropped back into the holding midfield role and we counted 20 passes he made in those final minutes, all of which went backwards. A few minutes after the sending off the game was all square as Ilkeston’s substitute Ryan Watts managed to get a boot to a ball in at the near post although their appeared to be a push on Telford’s Stuart Whitehead in the build up to the goal, but it would have been too much to expect such an ineffective official(s) to have spotted that. The home fans around us started giving some “friendly” banter to the Telford keeper, and in one of the reasons why we love football at this level, he gave some back without any fear of reproach. The last laugh of course was on him as with just five minutes left a deep cross from the right hand side was met at the far post by Jason Lee and he powered a header in via the crossbar to cap and impressive debut. There was still time for a good penalty shout for the home team when Whitehead appeared to bring down an Ilkeston forward. “You are having a f laugh mate” said the Telford defender to the fans around the pitch in response to their claims. Good to see that players at this level willing to interact. So the full time whistle went and within seconds we were back in the car having seen a potential pivotal moment in the Blue Square North season. Good to see Jason Lee still doing the business, nearly twenty years into his career and top marks for another ground with character, although work is needed on the chip front! For more photos from the game, click here.